South Florida rapper Rick Ross and a woman were uninjured after someone opened fire on the Rolls Royce they were driving in, causing it to crash into a building in Fort Lauderdale early Monday, police said. Ross, whose real name is William L. Roberts, was driving the silver 2011 Rolls Royce eastbound on E. Las Olas Boulevard near Southeast 15th Avenue when shots were fired around 5 a.m., Fort Lauderdale Police said. Ross, 37, and his passenger, 28-year-old Shateria L. Moragne-el, heard the gunshots and tried to drive away, police said. As the Rolls Royce tried to get away, the car crashed into the apartment building at 311 Southeast 15th Avenue. Neither Ross nor Moragne-el were injured, police said. Fort Lauderdale Police are investigating after a shooting led to a Rolls Royce crashing into a building early Monday, in an incident witnesses said involved rapper Rick Ross. Fort Lauderdale Police spokeswoman Det. DeAnna Garcia and two witnesses describe the shooting. Police are still looking for the gunman or gunmen, who fled the area before officers arrived. Authorities had earlier said Ross and Moragne-el didn't want their names released out of fear for their safety. "The occupants of the vehicle have asked for their information to be withheld from being released," Fort Lauderdale Police spokeswoman Det. DeAnna Garcia said. "They obviously, with everything that just took place, are fearful for their lives and their families lives." Witnesses at the scene said they heard as many as 20 shots. Police didn't say what the possible motive for the shooting was. "Him and his girlfriend sat to the side, and waited to get information to find out whether he was the victim or being victimized," said Beth Balk, whose apartment was struck by Ross' car. 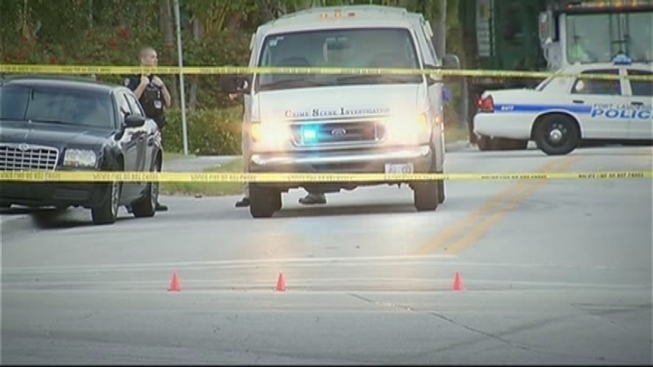 Ross made news last year after a body was found outside a Miami Gardens home owned by him. Police said Ross didn't live at the home. In 2011, Ross was arrested for marijuana possession in Louisiana. Fort Lauderdale Police are asking anyone with information to call them at 954-828-5546.